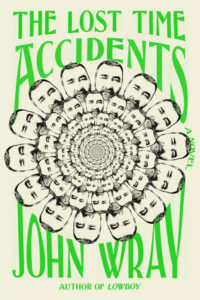 In his latest book, The Lost Time Accidents, John Wray exhibits an uncanny ability to make palatable scientific and mathematical theory, and weaves both into a complex storyline, set primarily in the present-day. Wray is adept at making complex, normally baffling, notions simultaneously interesting and poignant in a way that is both fresh and eerily familiar. This morning, at 8:47 EST, I woke to find myself excused from time. I can picture you perfectly, reading this letter. You’ll be telling yourself I’ve gone stupid with grief, or that I’ve lost my mind—but my thinking has never been clearer… Time moves freely around me, gurgling like a whirlpool, fluxing like a quantum field, spinning like a galaxy around its focal hub—at the hub, however, everything is quiet. It quickly becomes clear that Waldemar, named after his great-uncle, is compiling a family history in an attempt to explain the scientific eccentricities and obsessive ruminations that have plagued his family for over a century. The narrative is fairly straightforward at first, written in chronological letters addressed (we are to assume, in the beginning) to a lost love, a certain Mrs. Haven. Wray’s novel begins with Waldemar in the present, but we quickly go back in time, to pre-WWI Austria, and eventually move forward in time, to post-WWII Austria and surrounding Europe. Intermingling with such flashbacks and storytelling is Waldemar’s current predicament of being frozen in time, and so we also move between modern-day Albany and Brooklyn, New York. Much of the book’s intrigue stems from the fact that Waldemar Tolliver, a descendant of the prosperous Toula family of Austria, exists in this strange liminal space that is neither time nor not quite not time. He is the descendant of the Toula family in Austria, son of Orson Tolliver, who is himself descended from Kaspar Toula, brother of Waldemar Toula. In unfurling descriptions of the past and family occurrences, we learn the irony of Waldemar’s shared intrigue in scientific inquiry, as he is best able to understand and explain his family’s past with scientific theories. When a body, in motion, is not acted upon by any force, Newton famously wrote, that body shall continue on in a straight line, at the same speed. If the middle of Kaspar’s life was a plateau to him – a hilltop with an unobstructed view – then the future was a single smooth descent. And that temperate decline was all he wished for. The catch is that Waldemar himself often walks the line between sanity and the family curse, which has gripped his two elderly aunts, Enzian and Gentian. He lives in the shadow of his father, Orson’s legacy, who spent his life trying avoiding the truth of the family’s obsessive tendencies. And what would characters’ past issues and mistakes be without the notion of the narrator’s (potentially) unreliable memory? Memory is a politician, Mrs. Haven, as every historian knows: a manipulative, pandering appeaser. Firsthand witness though I am, inaccuracies are creeping into this account. It’s likely, for example, that my father took me to the movies a handful of times at the most… but that solitary memory, from my last year of grade school, is vivid and well-lit and sharply in focus, as traumatic recollections tend to be. The reader is incredibly close to the thoughts and happenings of Waldemar, as the letters he intends for Mrs. Haven provide direct access to his internal self, his motivations and desires. From the beginning, this closeness fosters a growing trust by the reader in the narrative, while these same moments often call into question his credibility. In fact, Waldemar has managed to piece together much of his family’s past from little more than worn documents and word of mouth. There’s no other way to put this, Mrs. Haven: as the weeks passed, you receded from my thoughts. It was the law of conservation of energy, not to mention the abhorrence of a vacuum, since I’d followed every lead and come up empty. During many similar instances, Wray ignites intellectual curiosity in the reader. Concepts normally difficult to grapple with are presented throughout, which not only causes Waldemar to see reality in new ways, but invites the reader to take this journey through time, and to perhaps come out at the other end with a greater understanding, or a greater desire to understand, the world. This juxtaposition of scientific thought, riveting narration, and epistolary form make for truly enigmatic, authentic storytelling. Gabriella Shriner is an undergraduate at Fairleigh Dickinson University and part-time librarian. She lives, writes, and knits in Northwestern New Jersey.